This article appeared in the The Wood County Amateur Radio Club newsletter CQ Chatter August 2017 edition. Have you ever been involved with an EmComm/ARES drill and heard digital tones as forms were being passed over a repeater? You may have wondered what application are they using, what mode, or how do they know what form is being sent? Chances are they utilized an established standard called NBEMS. The Narrow-Band Emergency Messaging System was created to pass text based messages and forms used by hams and other served agencies over Amateur Radio. Technicians, listen up! 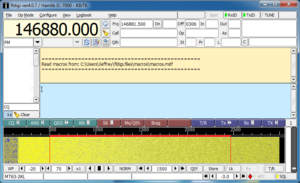 NBEMS includes standard modes for HF SSB and is very popular on VHF/UHF FM. NBEMS was established in collaboration between David Freese, Jr. – W1HKJ who created and maintains the Fldigi suite of applications and Skip Teller – KH6TY who created DigiPan, a popular PSK application. The philosophy specifies utilizing radios, software, and hardware readily available and widely used in ham radio. Older equipment and older computers can be used meaning it would be relatively inexpensive. 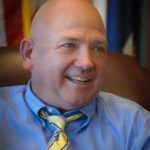 There would be no steep learning curve but flexible in an emergency situation. Finally, must be independent of infrastructure. No need for Internet, nodes, or existing communications systems. Power the computer, radio, interface, and you’re off-and-running. Interfaces between the computer and radio used for other digital modes work best. In accordance with the flexible and inexpensive philosophy, another option is available: no interface at all. That’s right, you don’t need any interface between a computer and radio in order to communicate. To receive data, the radio speaker is held to the computer microphone. To transmit, the radio microphone is held to the computer speaker. 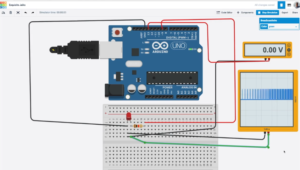 This method is called an “acoustic interface.” It’s a game saver in a pinch, doesn’t require any additional hardware, and allows anyone with a radio and PC to participate. The digital protocols used are robust enough to deal with ambient noise, casual conversations, too much audio, too little audio, and still be able to decode 100%. Though operating without an interface sounds like the best of all possible options, there are serious drawbacks. Transmitting (PTT) is done manually. Longer messages mean the operator has to hold PTT in longer. If their finger accidentally slips off the button, the message needs to be retransmitted. The operator needs to be more attentive to the station where it’s possible they may become distracted and miss messages. 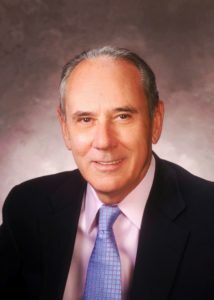 In a conference or war room, transmitting and receiving messages acoustically adds a layer of disruption to the setting. A connected interface would handle the keying, always provide audio to the computer for decoding messages – even while away from the station, and would not generate any additional noise effectively allowing the station to be completely quiet. As a whole, digital modes are not designed to work through an acoustic interface because most are sensitive to noise. Noise introduces errors making all or part of the transmission unrecoverable. An acoustic interface is a good way to practice or start, though the efficiency of a connected interface will soon be realized. NBEMS utilizes two different modes: VHF/UHF uses MT63-2000L, HF uses Olivia 8/500. 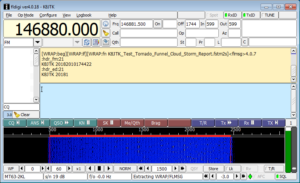 Both were developed by Pawel – SP9VRC. It is surmised that 25% of the characters in an MT63 transmission can be lost and the receiving station will still have a perfect copy. This is achieved by encoding characters over the time and frequency domains for robustness. In addition, the “L” versions have additional (long) interleaves providing even more error correction. MT63 is very forgiving of audio levels and tuning errors making it a great choice for EmComm. The suffix indicates bandwidth used, 2000/2K means 2 KHz. Transfer rate is about 1 KB/minute. Olivia 8/500 is used on HF because signals can be decoded below the noise. 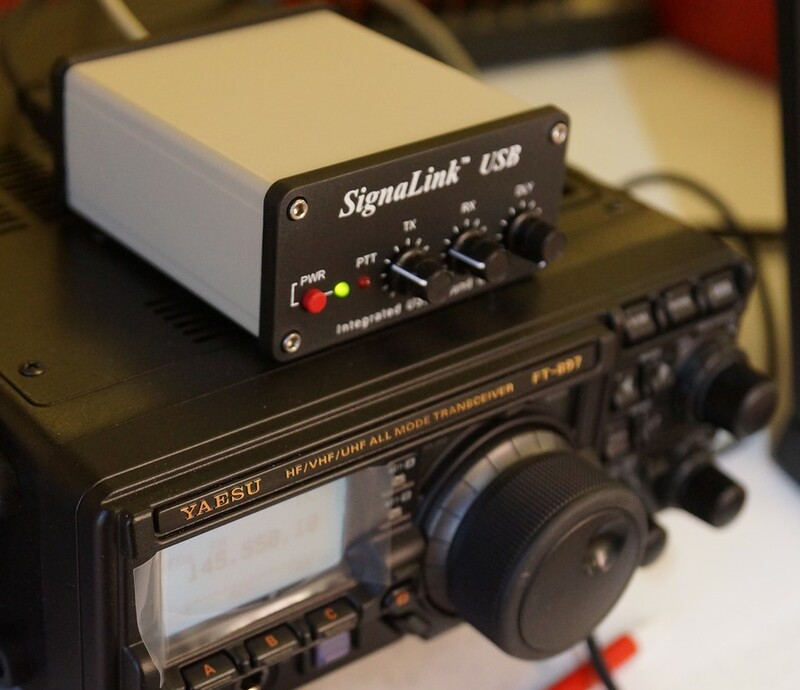 Low power and QRP stations can communicate nearly as effectively as a higher power station. A channelized approach is used because signals below the noise can be decoded but not heard or seen on the waterfall. The 8/500 indicates 8 tones utilizing 500 Hz of bandwidth. Fldigi suite reverses these in places, 500-8. Transfer rate is about 170 bytes/minute. A common question brings up the issue of popularity. PSK31 and JT65 are two popular modes on HF. Both are not used in NBEMS because there is no error correction for weak or fading signals in PSK. A faster, multicarrier PSK-R (for Robust) mode is occasionally used in NBEMS but I have not seen many groups use it as an established standard. 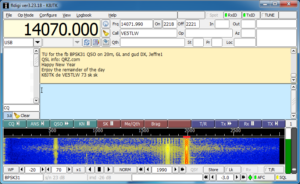 JT65 is limited to 48 second timed transmissions of 13 characters which is not efficient for data transfer. Two applications are synonymous with NBEMS: Fldigi and Flmsg. In the last article, I talked about Fldigi being one of the more popular multimode applications. Flmsg is another application in the Fldigi suite that manages forms. It can be used to send standardized agency forms like ICS, Red Cross, or MARS. Forms developed by local agencies can be coded as a “custom form.” Plain text (.txt) and comma-separated (.csv) files can be transferred. 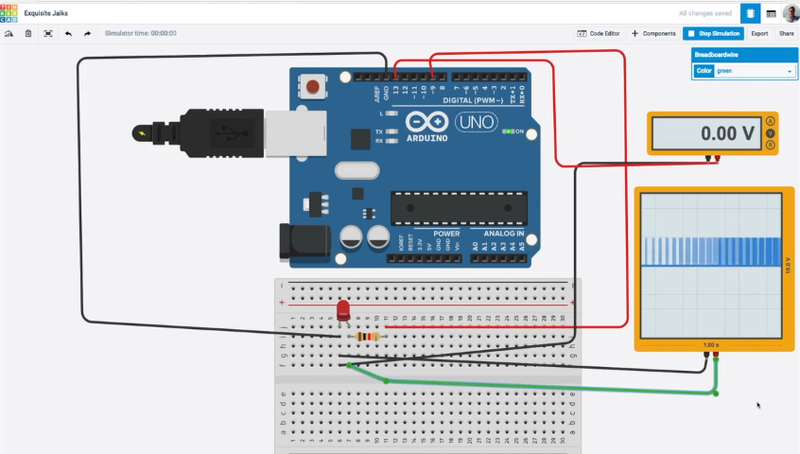 Sticking to the inexpensive and flexible philosophy, the entire Fldigi suite of applications are free, open source, and cross platform available on Windows, Mac, and Linux including Raspberry Pi. Custom forms are a popular use of Flmsg however, these forms need to be disseminated or available online ahead of time. Other applications like DM780 and MultiPSK can send and receive both MT63 and Olivia. These don’t have provisions for managing forms or validating transmissions. Fldigi and Flmsg are integrated seamlessly to pass data between the form manager and modem application. A very important behind the scenes, but not often discussed feature in NBEMS is the checksum. In computing, a checksum is used to detect errors in transmission or in storage. 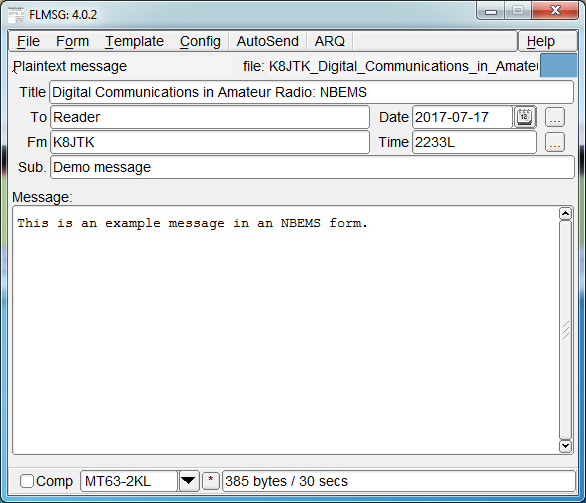 Flmsg automatically generates and includes a checksum as part of the message with each transmission. Receiving stations calculate a checksum value based on the data received and compare it against the value included in the message. This is an ease-of-use feature letting receiving stations know if they received a prefect copy of the message. If the checksum matches, Flmsg will open displaying the form or message. If the checksum fails, this means an error was introduced in transmission. As a result, the message will not open or a “Checksum failed” prompt will be seen. 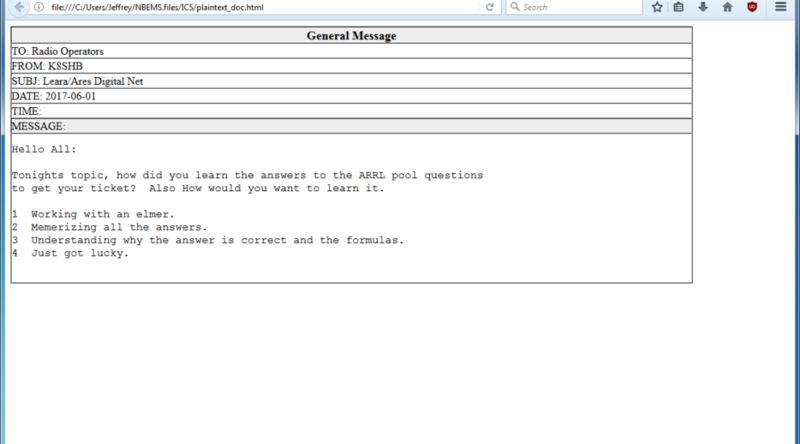 :mg:44 This is an example message in an NBEMS form. A checksum value is included in the “WRAP” tags and is 2CBF for this message. Upon receipt of this message, Fldigi automatically calculates a checksum for verification. If it arrives at the value of 2CBF, the message was received perfectly. 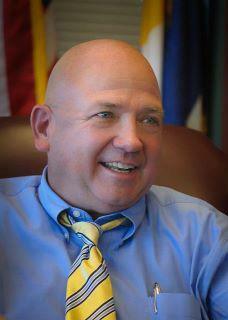 There are limitations of NBEMS that users and served agencies need to be aware. To meet FCC requirements, all data must be transmitted within 3 minutes on a repeater with a standard time-out-timer or 10 minutes on simplex. This means a maximum file size for MT63-2KL on a repeater is 3,000 bytes and 1,700 bytes for Olivia 8/500 on simplex. These properties severely limit the content that can be transferred to text. Word documents need to be converted to TXT and Excel spreadsheets to CSV files in order to save bandwidth. There are not many useful images, Word documents, Excel spreadsheets, and executable programs under 3K. This makes high-resolution images and large data transfers impractical using NBEMS. Remember, it is a Narrow-Band Emergency Messaging System. Reminder: review the first two articles in the series for information that will be omitted here including some modes operate your transceiver at 100% duty cycle, use upper sideband (USB), and don’t drive the transmitter with too much audio as the signal will be wider than intended. Operating data over FM is the same as operating voice and does not change the duty cycle of the radio. However, operating FM at high power for prolonged periods of time is considered extreme for most radios and will likely shorten the life of the transceiver. In addition, review the fourth article on “Conversational Modes” as Fldigi was covered. With Fldigi setup and working, download and install Flmsg from http://www.w1hkj.com/. To prepare Fldigi for VHF/UHF NBEMS, click Op Mode, select MT63, and click MT63-2000L. MT63-2000L is also abbreviated as MT63-2KL in other places within the Fldigi suite. These are the same, 2K = 2000. 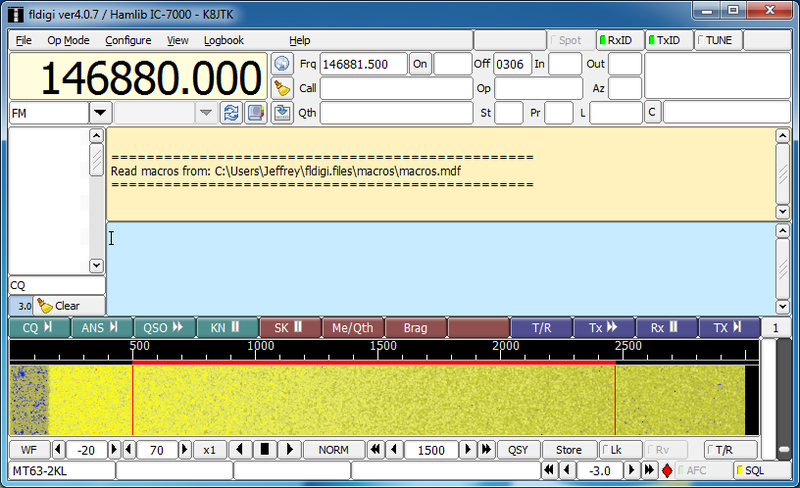 With MT63-2KL selected as the active mode, now center the receive window on the waterfall at 1500. 1500 Hz is the standardized center frequency. For HF NBEMS, replace MT63-2000L references with Olivia 8-500. 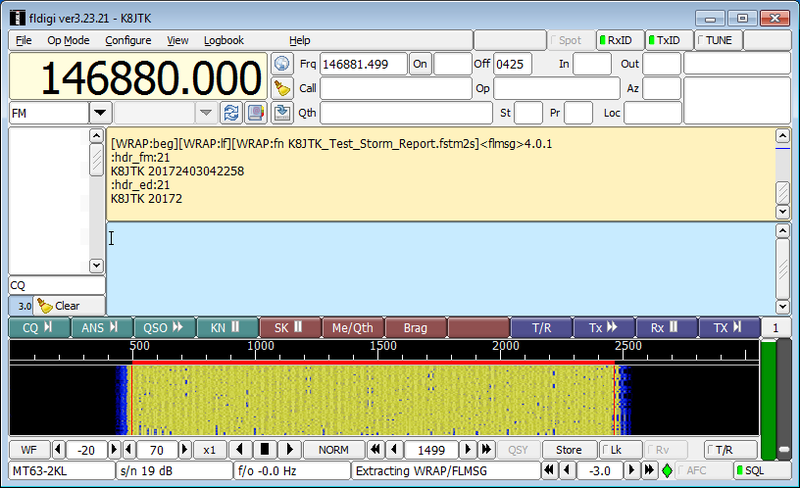 Fldigi passes data to Flmsg for decoding and displaying. Fldigi needs to know where to find the Flmsg installation. In Fldigi, click Configure, select Miscellaneous, then click Misc to enter the Miscellaneous program options. Finally, click the NBEMS tab. In newer versions of Fldigi (later than 3.23.0), uncheck the Transfer direct to executing flmsg. Open with flmsg and Open in browser should be checked if they are not already. Now click Locate flmsg. Depending on the version of Windows, the default installation location for Flmsg will be C:\Program Files (x86)\flmsg-x.x.x or C:\Program Files\flmsg-x.x.x. In that directory, select the flmsg application, click Open. Click Save, then Close. “x86” is a Windows designation to differentiate 32 bit from 64 bit applications on a Windows 64 bit installation. “x.x.x” is the version of Flmsg. Each time a new version of Fldigi, Flmsg, or any other Fldigi application is installed, it is kept in a separate directory with the version appended. Alot of versions can accumulate on a system if frequently updated. Anytime uninstalling or using a new version of Flmsg, the steps above for “locating flmsg” need to be repeated. Start Flmsg. A dialog prompting for the selection of a “Default User Interface” will be seen on a new installation, click Communicator/Expert. Station information will be requested. These are used as inputs for some forms. Call sign should be filled in as a minimum. Click the red “X” when done filling in station information. At the bottom of the main Flmsg window is the mode selector. Click the down arrow and select MT63-2KL. 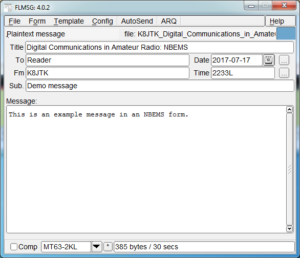 To use Flmsg, a blank Radiogram will open initially. To select a different form, click Form. 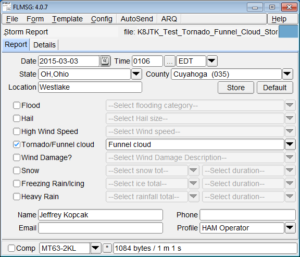 Different types of available forms are categorized: ICS, MARS, Radiogram, Red Cross, weather, and custom forms loaded will be available from this menu. Choose any form for practice. Standard practice is to note somewhere in the form that this is a “test,” “practice,” or “drill.” As with voice, someone may mistake the transmission for a real message. Once the form is filled out, set your radio to the appropriate frequency and open Fldigi if it is not already. Set it to MT63-2KL centered at 1500. 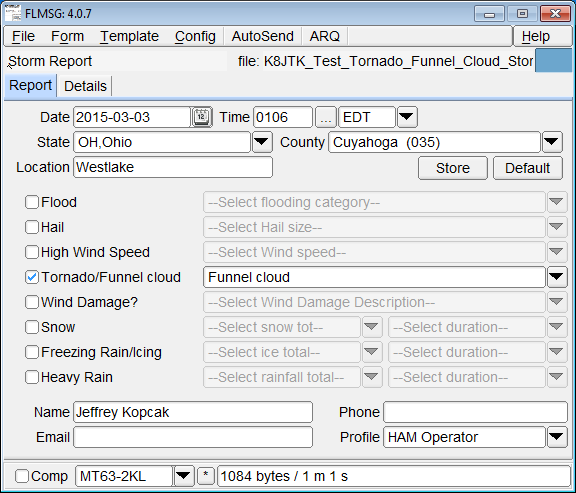 Verify the mode selected in Flmsg is MT63-2KL. Click AutoSend. The file must be saved before it will transmit. Once the file is saved, transmission will begin automatically. 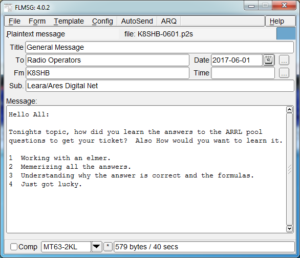 Get into this habit of checking transmit frequency, Fldigi configuration and Flmsg configuration before clicking AutoSend. Otherwise you will inadvertently transmit on a different frequency or in a different mode. It happens to everyone eventually. Receiving stations only need to open Fldigi. They will first see the message appear in the Fldigi receive pane. The form type is transmitted as part of the message. In the example message, <plaintext>. The lines begin with the form field name and check of the number of characters in that field. 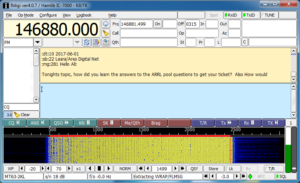 “:fm:5 K8JTK” is the “from” field with a check of 5 characters, “K8JTK“. When completed, an Flmsg window will open. 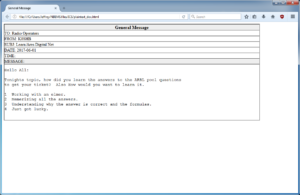 The form will also be rendered in the default web browser. Receiving stations don’t have to do a thing except wait for the transmission to complete. If the next message received is a Radiogram, Flmsg will automatically open a window and browser page displaying the Radiogram format. That’s it for using NBEMS! I have a more detailed setup and walk through of installing and configuring Fldigi and Flmsg. My instructions include another Fldigi suite application called Flwrap. Flwrap allows files of any type to be transferred. It sounded, at one point, like it was going to be part of the standard set of NBEMS applications but never made it due to the file size constraints. 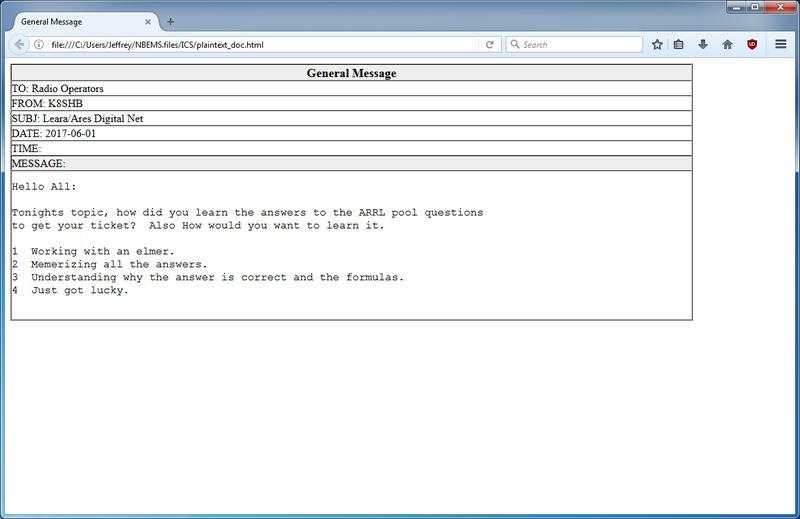 Additionally, Flmsg performs similar functionality to Flwrap in its ability to send TXT & CSV files. The Flwrap parts can be skipped unless they are found useful. Typically, you’ll need to setup a sked or hold a net to pass messages around. Operators don’t sit around watering holes sending Flmsg messages, though I have seen it! 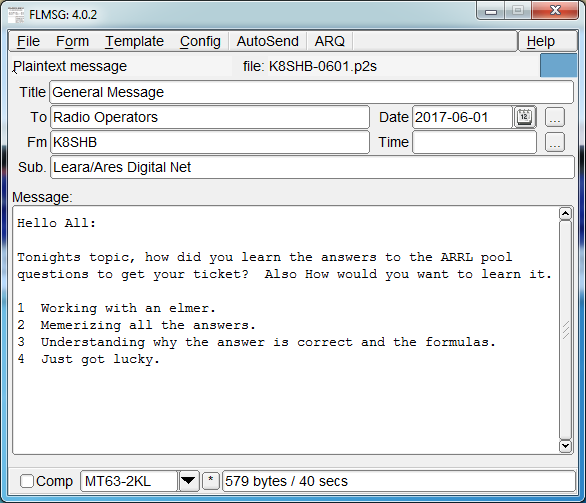 Use news on QRZ.com or ARRL Ohio Section updates as text to fill out the forms as practice. Participating in a couple different nets, there seems to be less problems when everyone is using the same versions of the applications. An Android smart phone app is available at the same site as Fldigi called AndFlmsg. There is a INSTALL.txt file with install instructions. The app is not available through any of the Android app stores and must be installed by temporarily enabling the option to allow applications from “Unknown sources.” A user guide is available in the same directory as the download. This will be helpful as the interface is not entirely intuitive. The Ohio Digital Emergency Net (OHDEN) is a weekly HF practice net that uses the Olivia standard. Checkins and coordination is accomplished using the text input box in Fldigi. There is no voice coordination. Formal messages don’t happen every week but are passed using Flmsg. OHDEN meets Tuesdays at 7:45 PM eastern on 3.585 USB using Olivia 8-500 centered on 1000 Hz. Happy New Year. Welcome to 2016! 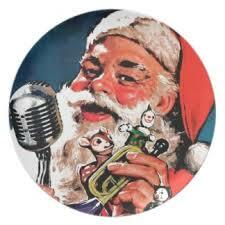 Hope Santa was good to you and left you a new radio under the tree. A white Christmas would be nice but I’ll take the warm temperatures we had for the holidays. I took some MUCH needed time off from work and spent it: sleeping, doing things with friends and family, operating on the radio, and watching NCIS. Got a couple hundred JT65/9 contacts in the log (really because I was slacking the last couple months and to make up for lost time! 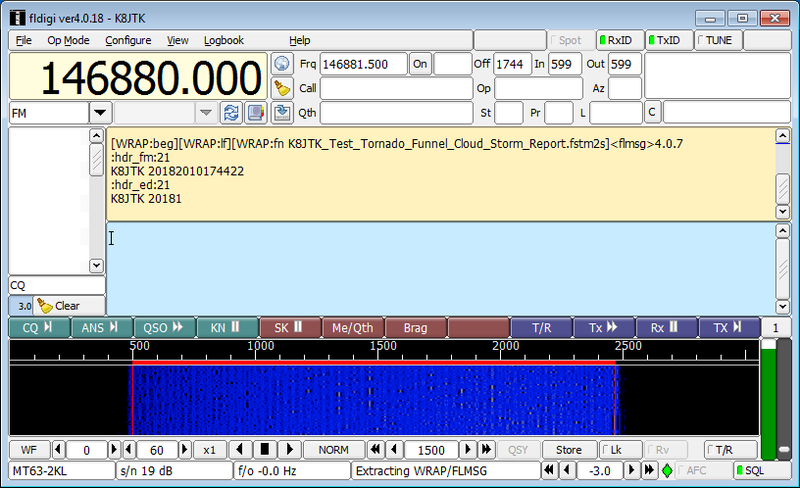 ), played with Yaesu’s System Fusion, and WSPR (Weak Signal Propagation Reporting). I hope everyone got to spend some time at their local club’s holiday parties. My family and I attended the LEARA (Cleveland) holiday meeting where I won the club’s giveaway of a new Baofeng radio and also a hat courtesy of our own Section Manager! This past weekend (Jan 10), I visited the Wood County Amateur Radio Club (Bowling Green) and attended their Kick-off banquet to begin the New Year! Great to see everyone. A couple months ago, I decided to see if I could get Fldigi working on the Raspberry Pi with my SignaLink. 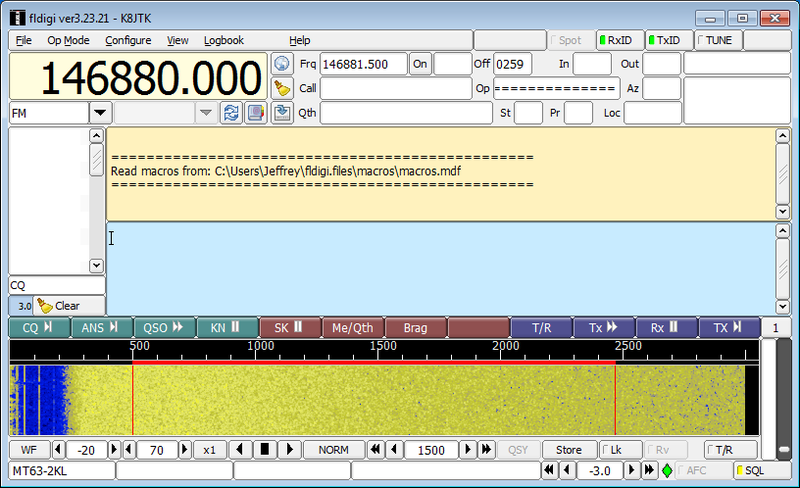 Fldigi is a modem application that is used for message passing or operating PSK, RTTY, and many other digital modes. I thought the tutorial could be a good resource for those who want to replace large PCs with much smaller Raspberry Pi computers or install digital in their go-kit. It was a success, or so I thought. I hit a couple snags along the way during initial testing. The first problem was a junky USB power supply. The SignaLink would key the radio for a time but would start a key-unkey sequence every second or so. I got what I paid for — use quality parts in your project. I swapped out the power supply. After that, I thought it was good to go. On Saturday 5 December, Medina County ARES conducted a damage assessment drill with Medina County CERT team. The exercise was centered around the Damage Assessment form that I created for FLdigi. The objective of the exercise was to complete an initial damage assessment of an area that had been hit by a tornado. This initial damage assessment must be completed by the County EMA within 12 hours. This initial damage assessment is used by FEMA, the Red Cross, and other agencies to increase their situational awareness. The information is used to determine the size of the response necessary for the incident. The exercise was a resounding success! CERT was divided up into six teams. Each of these teams had a mobile / portable ARES station paired up with the team. The CERT volunteers filled out the damage assessment forms and the ARES stations transmitted the forms back to the County EMA. The amount of information passed in a short amount of time was quite impressive. One of the key things that I think we learned at this exercise was to keep the digital traffic on a separate frequency and separate band from the FM phone net. The traditional FM phone net was established on a 70cm repeater. A two meter simplex frequency was designated for the digital traffic. The portable ARES stations would use the FM phone net to ask permission to send digital traffic on the digital channel. This permitted the normal FM phone net to resume operations while the computers did all the work transferring the digital traffic on a separate channel. It’s critical that the digital channel take place on a different band then the FM phone net, so that the digital traffic receive is not de-sensed from adjacent frequency intermod. It’s also important for the stations doing a digital transmission on an FM phone frequency to announce: “CALLSIGN with tones” before transmitting. One of the digital transmissions went over a repeater and a non-ARES ham that was listening, thought the repeater was malfunctioning and allowing paging signals to be re-transmitted. 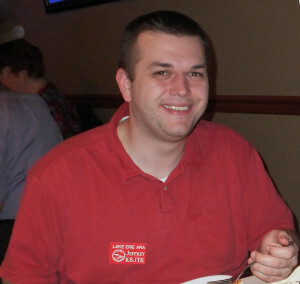 Mike Brugger, N8CEY is the ARES EC for Wayne County. He came up to observe the exercise from the Medina County EMA. I helped him get FLdigi and FLmsg installed and properly configured on his laptop, while he helped me with Net Control duties. Mike left with an extremely positive appreciation for the digital traffic handling. He’s planning to take the knowledge back to the Wayne County ARES team and start training on FLdigi.